Efficiently shaking of flasks from 100-1000 ml. conical or Round bottom. Speed 80 to 280 oscillations per minute. Suitable for dissolving, dispersing, extracting and emulsifying. Electrically operated with variable speed control. Note:- Please ask for other capacities of your requirement. 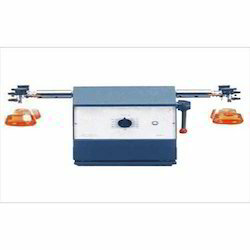 We offer Wrist Action Shaking Machine which is a general-purpose machine and found very useful for mixing or agitation ingredients, solution in flasks. We have designed these machines to hold flacks from 100 ml to 1000 ml council or round bottom. - Variable speed controlled by regulator fitted with Fractional HP Motor. - Power Supply 220 volts AC -50 Hz. 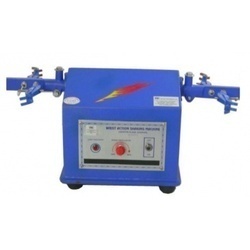 The Wrist Action Shaking Machine which we offer has been fitted with D.C. MOTOR to work on 230 VOLT A/C 50 CYCLES smoothly for a longer period smoothly. This is a wrist action shaker capable of holding 4 to 8 flasks of 50 to 250 ml capacity with any type of neck. The oscillation is variable continuously by adjusting the FHP motor speed using the knob on the front panel. D. C. Motor special system shaker to work on 220 volt a. C. For variable and smooth function speed control by speed regulator. This mechanism is made from heavy cast iron & finished with a thick layer of epoxy based polyster paint.